Canberrans! I bring you good tidings of great joy! 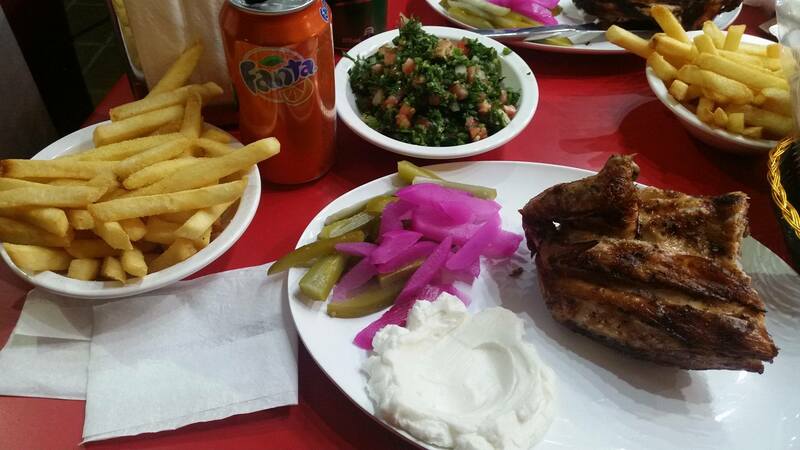 Canberra FINALLY has a charcoal chicken place that’s run by a bunch of Arabs. Yes, it’s Halal. Thanks to a good friend of mine, I found out about this new El-Jannah-like place this afternoon. Of course, I had to check it out for myself. Tonight, my tired, weary fasting body sought its bountiful glory – and good God was it bountiful and glorious. The place is run by former EJs staff, meaning you get the real stuff. Of course, I went for the quarter chicken + chips + pickles + drink meal. Total cost? $11.50. The chicken was fresh… tender… and deliciously charcoaly. I told the owners I was there to compare it to EJs, so they bought out a complimentary side of tabouli that tantalised the taste buds with its lemony goodness, and some complementary falafel that had the right crunch and the right fluffiness; just like maama makes. And yes, for those of you asking, the toum (garlic sauce) was garlicy and creamy and brought the meal together in the most beautiful way. The owners were so generous and sweet. One of them insisted that he would carry this older woman’s family meal to her car for her. How beautiful is that? Since I entered the realm of Canberra almost three years ago, I have yearned for a charcoal chicken place. I missed it so much that I held my first birthday gathering after moving to Canberra at a charcoal chicken place in Sydney. I have missed that feeling of knowing that I’m going to get a good, cheap meal every time. Today, I am finally at peace with Canberra. I am home. But seriously. Go and check this place out. The food was delicious and the service was amazing. If you go there now, you get to be part of the group that says ‘oh my God, a proper charcoal chicken place has opened up!’. That makes you cool. Oh – and here’s the menu (click to enlarge). Want to keep up to date with new posts? Feel free to Subscribe!